Currently, a large building complex is being constructed on the outskirts of Moscow, where a completely new residential area sees the light of day. During the construction period, the houses are protected from bad weather by Rani’s plastic film. 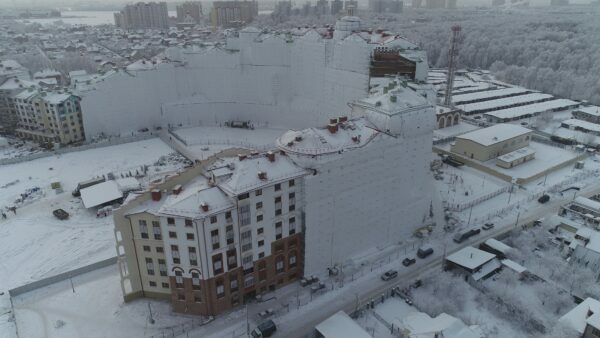 As the pictures show, the building complex in southeastern Moscow is enormous, and enormous is also the amount of film needed to cover the buildings – a total of 120,00 square metres. This is by far the largest project where the film RaniHeavyShrink has ever been used. RaniHeavyShrink is a durable film used to protect large industrial products. The film is also excellently suited for covering building scaffolds used for façade and roof restorations. Compared to tarpaulin, you get a very tight and flexible protection, which is also recyclable after use.